From the minute we moved into the “London, Sugar, and Slavery” section of the Docklands Museum I think we all knew it was going to be something different; something unlike other things we typically see when at a museum. Being a very visual person I was immediately drawn to a video that began as we entered the area. The film was the reading of a diary of an enslaved African (as the Dockland Museum’s terminology sign stated it would refer to slaves as). Images of different people mouthing the words of his diary flashed across the screen along with other scenic and touristy images of London, as a man’s voice spoke it and the words of the entry scrolled along the bottom. The letter ended with the final words, “someday I hope this will all end, and we will all be free.” I simple wish of a man who could do nothing besides hope for the best in the future. Keeping that video in mind I strolled through the remainder of the exhibit reading the signs and refreshing my memory of what I have learned about slavery in the past. But when I got to the end of the exhibit I immediately stopped in my tracks. The final wall in this area as entitled “Loss & Liberty” and featured modern ceramic artwork paired with poetry. I moved through the artwork and poems slowly, taking in each one as it came. The Caribbean rose, the faces of strained men and women, and the repetition of these images returned my thoughts to the video from the beginning of the exhibit. The repeated modern images and the eloquent words of the enslaved African from the past, paralleled with the ceramics and the words of current men who have experienced, have heard, or are experiencing similar thoughts and feelings as the man did writing in his diary in the 1700s. At that moment the exhibit all came together for me in a world of history, art, and culture all uniting, blurring, and mixing– into one. As a person who went to urban public elementary, middle, and high schools that were primarily African-American, I used to consider myself well read on the subject of slavery. I was taught very little about world history and anything remotely confrontational. My pre-college history education could probably be described as being very limited in all areas except 2: Slavery and the Civil Rights movement. When a teacher would introduce the subject of slavery I admittedly let out a big sigh, as I really wanted to learn something new. When I arrived in the slavery section of the Docklands Museum, I quickly began to realize that like most of my early history education I was not taught the full story. I only ever learned about the enslavement of Africans in America and only very briefly covered how the Africans came to be enslaved. The triangle trade route was just a picture in my history book that confused my middle school self; I would stare at the picture wondering why the route went from Britain to Africa and then to the West Indies rather than to America. Also, if asked in my early years of high school to point out the West Indies on a map I probably would not have been able to. The Docklands Museum focused on the how and the why of slavery in the West Indies (and the Americas) that I was never really exposed to in high school. I learned that the Portuguese were actually the first to start the slave trade, not the English like I was taught. In high school I was taught that England started the slave trade and that they were the only ones completely to blame for its beginning. I also learned a lot more about what slavery looked like in the West Indies, as opposed to in America. I learned that even after African-Caribbean slaves were given their “freedom”, indentured servitude was used in a way that greatly resembled slavery and that they really were not free at all. I was also able to read profiles of slaves, slave owners, and slave dealers in England and in the West Indies. These profiles enabled me to see the human side of slavery. This, rather than the dates and statistics, made the history of slavery more real for me and gave it a very personal dimension that I found very touching. The longer I am in England the more I learn, and the more I realize that I have A LOT to learn. The Docklands Museum helped me to see a different side/perspective of a history that I thought I knew a lot about. Ever since I took a Museum Studies class at Dickinson, I appreciate exhibitions in a whole different way than I used to. Today I visited the Museum in Docklands, which covers London’s history from its creation, to the present day, particularly focusing on the port as a key element to understand the city’s relationship with the rest of the world. When I walk into a museum, I try to find the “script” or the underlying message in the exhibit, that is, why are the objects arranged in a particular way and what is the ideology that is being articulated through this arrangement? In the museum I went today, I paid particular attention to the gallery or section entitled “London, Sugar and Slavery”. Apparently, this museum is the only one in London that has a permanent collection that examines the capital’s involvement in the transatlantic slave trade. The information on the exhibit was extremely interesting and I discovered there was much I did not know about the slave trade. But what I thought was most interesting was the way slavery was explained. First, I can imagine that a museum actually acknowledging the atrocities that were committed by Great Britain to its colonies, is a relatively new phenomenon. I believe it is very positive that the museum focuses on the slave trade instead of showing the greatness and opulence of the British empire, which was precisely built upon the suffering of millions. This always happens to me when I am in a rich European capital. Coming from Latin America, I am aware of how much Europe is to blame for the history of the countries that are now called the Third World. For example, when I was in Spain, whenever I saw an ostentatitous building painted in gold (most of the time they were Churches) I would think: How many people had to die in the mines of Bolivia so that this place would look like this? The same thing happens to me at the British Museum when looking at all the historical objects that were blatently stolen from other countries. A second aspect of the Museum in Docklands that I observed was the very clear importance of political correctness in the making of the gallery. For example, there was a large wall sign explaining how the museum was particularly careful with the terminology used when referring to slaves, black people or white people. Instead of using the term “slave” they used “enslaved African”, or “European people” instead of “white people”. Third, what I thought was an extremely important piece of information for understanding slavery, was the explanation by Caribbean historian Eric Williams on how slavery was abolished not really because people at the time thought it was morally wrong but because they discovered that it was not longer profitable! Apparently the monopoly of the big slave trading companies where obstacles for free market and the further economic growth of Great Britain. It was clear that every aspect of the exhibition aimed at acknowledging a mistake and judging history. One painting that struck me was a portrait of the most important owner of a plantation in Jamaica, which the museum chose to put next to a title that said “Slave Owner”, instead of writing the man’s name. But the exhibit went even further, so much to the point that there was a projection in which the words that were one pronounced by slaves were now being mouthed by people from different ethnicities, which could lead to the idea that, either some people in London today are suffering almost as much as slaves used to. At the same time, the short film could stand for the idea that every London should be aware of the dark history on which the city was built upon. More and more, museums have become tools to rectify history, to articulate the government’s mea culpa. I believe the Museum of Docklands is one example of this phenomenon. left overs of the Roman occupation, but rather creations of the 16th and 17th centuries, and while we no longer see forums or bath houses, we only need to look to realize that the founders of this city are not as distant as we thought. After a bit of trouble navigating the DLR (apparently the train we got on didn’t happen to stop at West India Quay, despite what it said on the map), all thirteen of us arrived at the Docklands Museum after a bit of a hike between the DLR stop we got off at and the DLR stop we were supposed to arrive at. I must admit we were all rather tired and “museumed out” after our walking tour and our trip to the London Museum earlier, but we quickly realized that the Docklands Museum had a lot to offer. The London Sugar Slavery Gallery exhibit stuck with me the most. I tend to automatically think of slavery as an American phenomenon, something tied in with American plantations and Abraham Lincoln and the Civil War, but it was interesting to see the more urban lives of the British African slaves, as well as the fact that many slaves (and later, indentured servants from China and India) were sent to the British-owned sugar plantations in the West Indies. Strolling through the exhibit, I thought it was well done, with equal attention paid to the lives and conditions of the slaves, the Abolishionist movement, and the influence slaves’ work today. However, upon coming to the end of the exhibit, I was surprised to discover that many visitors to the museum did not find the exhibit satisfactory and were so displeased that they felt the need to leave notes, which the museum had collected into a binder. Several commenters thought the exhibit was a waste of space, since the slave trade and its inhumanity were not the commenters’ faults and they claimed they didn’t need to apologize for it. Others thought the slaves’ plight wasn’t documented graphically enough and that the exhibit glossed over the conditions they lived in and the treatment they faced. Still others were disappointed that the museum had chosen to devote so much space to the slave trade and not as much to British innovators and historical figures. After reading through many of the comments, several of us sat around discussing the complaints and why we found the commenters’ arguments to be inadequate. Firstly, many of us felt that the fact that the sheer amount of artifacts, quotes, artwork, and lasting influence on today’s British culture merited the inclusion of the exhibit into the Docklands Museum, and that the exhibit clearly and diplomatically relayed all of these things. The exhibit did not ask Britons to apologize for the acts of their forefathers, nor did it seem to try to make a visitor fee guilty for the actions of the past. Secondly, there is a fine line between what is appropriate to be displayed and what is not in a museum which is obviously family-oriented. Given the fact that the museum has younger visitors, as well as visitors who might not want to be confronted with more graphic images and explanations of the slaves’ lives, I would say that they did an accurate, tasteful job of describing their conditions and treatments. Thirdly, I don’t believe that the Docklands Museum claims to represent every aspect of London and its history: it’s simply impossible to fit so much information into one building, and not all of what can be exhibited can fit in one museum, either. There are many other museums in the city which undoubtedly have exhibits on the more well-known London historical figures and innovators, and though some commenters disagreed, we found the slavery exhibit to be refreshing and somewhat unexpected, since we are accustomed to only hearing about the American side of the slave trade and the consequences there. I suppose there is ignorance everywhere. Apparently, Sarah and I had not walked enough the past few days and decided to go on an exploration of the Tower Hill section of London yesterday. We arrived at the Tower Hill station, appropriately named, and wanted to walk towards the section labeled “Beheadings”, but decided not to. After walking around the outside of the Tower of London, we decided to head over to the War Monument for the Merchant Navy. It was a beautiful garden/memorial area that had a few people strolling about. After that, we decided to go whereever the streets led us. We stubbled upon St. Olave’s Church, where Samuel Pepy’s, Mother Goose (apparently) and 365 people from the 1665 plague are burried. Upon more walking, we discovered a church (that I cannot recall the name of) that was left in ruins after the war. There was a quaint garden and small fountain where a few people were sitting around. The ruins were also open to elements and the public and it was interesting to see once stained glass church windows now covered in vines and vegatation. Sarah and I noticed while walking around that there were very few people on the streets once we got away from the more “touristy” areas. I guess it is strange to me that not all of London is bustling along the streets all the time, because it is such a big city, but I am finding that this is not always the case! Turning a corner, we noticed a sign for Pudding Lane and, thinking that the name was adorable, decided to walk down the lane. Little did we know the significance of this lane! We saw people at the end of it, standing around something and taking pictures. As we walked past a building we were both stunned by a large monument. 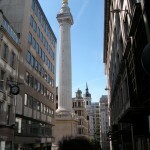 Appropriately, the monument we stubbled upon is called “The Monument” because it was built to commemorate the start of the Fire of 1666 in Pudding Lane. Now Pudding Lane did not seem so “adorable” anymore. 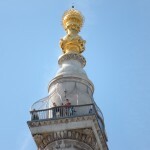 The Monument, I learned, was built by Sir Christopher Wren between 1671 and 1677 and was built to be 61 metres high, the exactly distance between the Monument and the start of the fire in Pudding Lane. Sarah and I, for whatever reason, decided to walk up the 311 steps of the Monument as if we had not walked enough already! The climb though proved itself worth it because we had a marvelous view of London. Then we had to walk back down. To continue our “stroll” we decided to head towards the “London Bridge” (which is actually called Tower Bridge). After crossing the real London Bridge, we found Southwark Church at the base of it. Southwark Church was a beautiful on the inside, and we managed to step in as a traditional Latin service was going on. We then left the church and headed in the general direction of the Tower (or “London”) Bridge. After about 20 minutes or so of walking, we finally rounded a corner and found ourselves face to face with the Bridge. Even for it being such a commecial site, it is still breathtaking. We noticed there was an exhibit going on in the bridge towers themselves (if anybody would like to do that in their freetime, make note of this!) but we both decided we did not want to do anymore walking up stairs that day!